You’ve committed to blogging and the deadline is looming …but the screen in front of you is blank. So you ask yourself the biggest question in content marketing. What to blog about? Good news! Blog topics are everywhere. 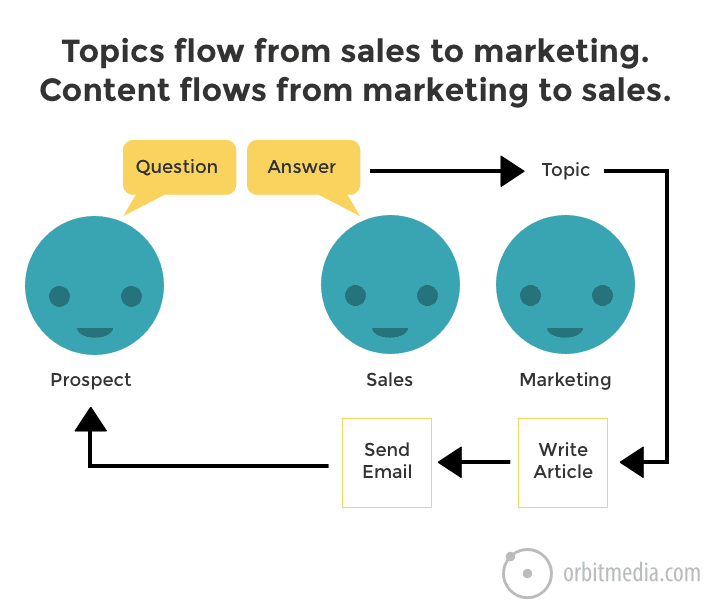 We recently covered the types of content that support the lead generation funnel, but we didn’t explain how to find the specific blog topics that your visitors want to read. To show how easy it is to find blog topics for any business, let’s use a random word generator to find a theme. Get ready for our random word… bake. So today we’re a baking company, blogging about cakes and baking. But of course, each of these sources for blog post topics can be used for any company in any industry. Keyphrase research isn’t just for SEO. It’s a powerful tool for content strategists. It’s a fun, fast way to read the minds of millions of people and find great blog topics. Whenever you search in Google, you’ll see suggested topics as Google auto-completes your query with a longer phrase. This is convenient for searchers, but it’s a gold mine for bloggers. 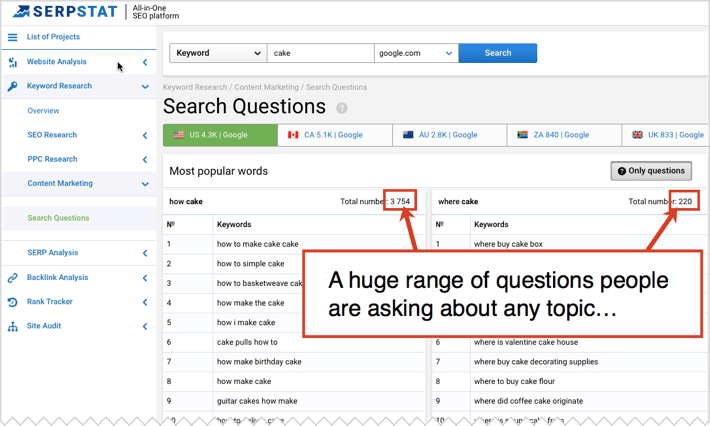 Just type in a question word (such as “which”) and your topic word (such as “cakes”) and Google will suggest a list of blog topics. Add a letter and you’ll see more suggestions. But it’s a long slow process to enter all 26 letters of the alphabet. Fortunately, there are tools that do this for you. One of them is Keyword Tool. These may be topics you would never have thought of. And each of them is pulled directly from Google, proving there is demand for the topic in search engines. These are blog topics that can win search traffic and attract new visitors. Another tool that pulls topics from Google Suggest is SerpStat. It has a nice feature that filters out question phrases. It doesn’t remove duplicates and close matches as well as Keyword Tool, so there is a larger number of questions, but you’ll have to filter through to find the good ones. These question-related topics are excellent for the top-of-the-funnel blog posts that drive traffic. 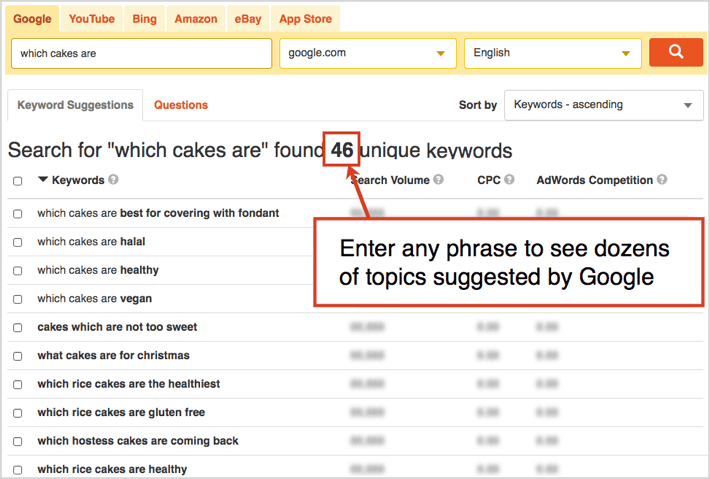 The Keyword Planner is the bread and butter tool for researching keywords. It’s part of AdWords, but you don’t need to advertise on AdWords to use it. But you do need to log in with a Google account. This tool suggests up to 800 phrases, each of which is a topic with a ranking advantage. 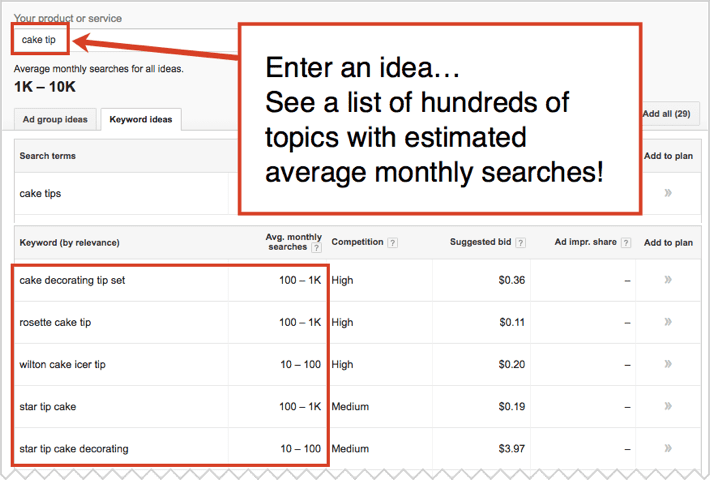 Note: The Keyword Planner also shows you the number of monthly searches for each phrase. That number isn’t super accurate, but that doesn’t matter for now since we’re just looking for ideas. 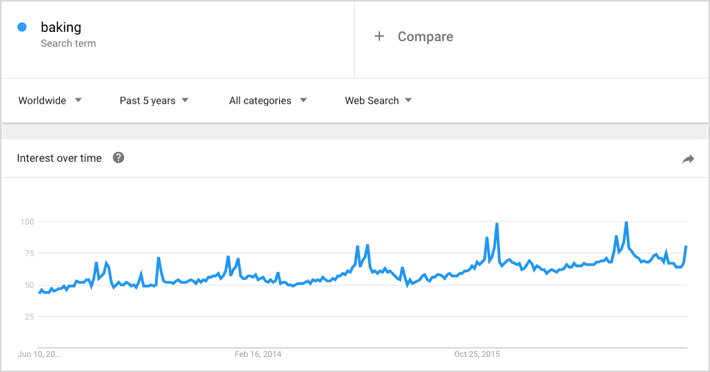 Google Trends also makes suggestions, but mostly it shows the trending for phrases over time. It’s useful for checking seasonality. 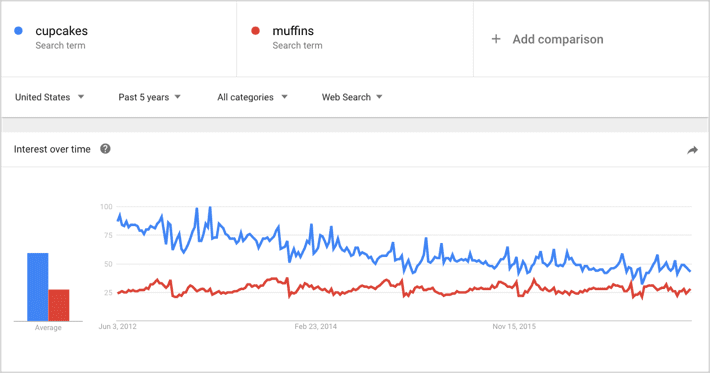 Here you can see the seasonality of search demand for “baking.” It’s a holiday thing. Finally, look in the bottom right corner to see a box with a list of 25 recommended phrases. Select “Rising” from the dropdown to see phrases that are suddenly becoming more popular. Social is for sharing, but it’s also for listening. And since social media data is mostly public, it’s a deep well of topics. It’s fast and easy to find what’s getting traction. This tip might be the very best. And the tool you’ll use, BuzzSumo, is one of the most powerful. It has a paid and free version, and both can be used for social listening. 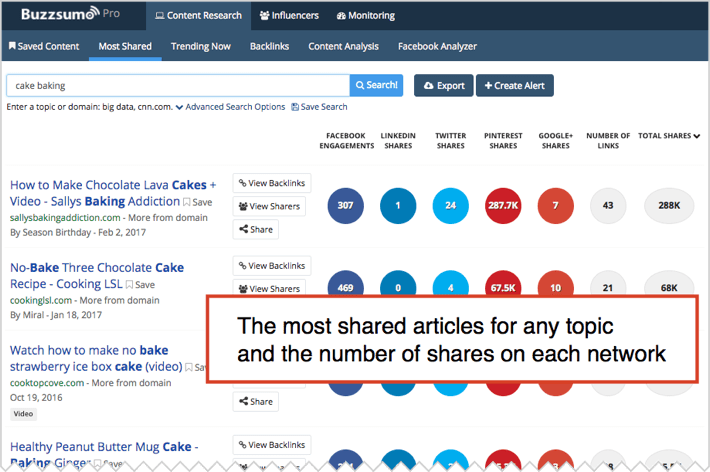 Enter any phrase into the BuzzSumo Content Research tool and in seconds, you’re seeing the most shared posts on the topic. They are broken down by social network, showing where each piece got the best results. 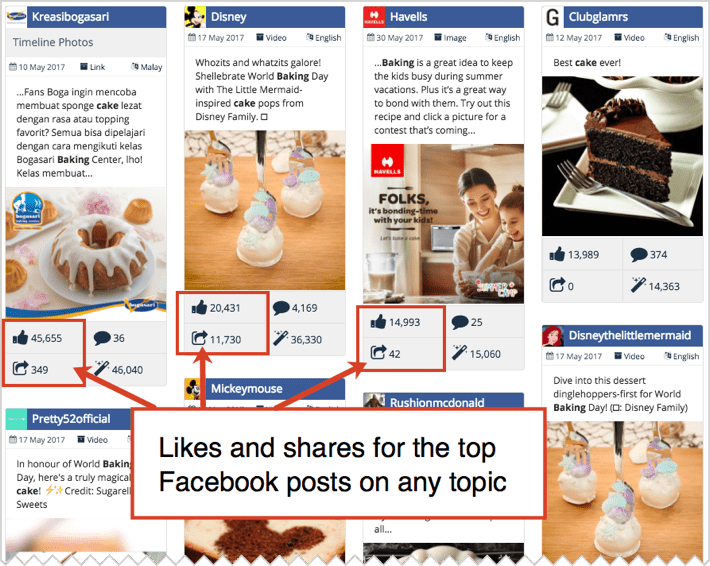 Then try Buzzsumo’s Facebook Analyzer to find trending topics on Facebook. Set the date range for 24 hours (jump on a trend) or the past year (find a durable social topic) or anything in between. 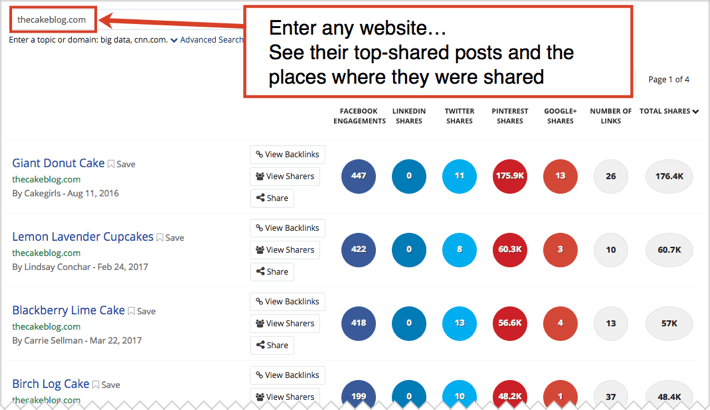 Once you find that super popular post, use BuzzSumo to see who shared it. If they liked that post, they’ll probably like the piece you’re about to write. Reach out to them and share your article. Or better yet, collaborate with them when you’re writing it! Quora is the jackpot of questions, answers and experts. If you’re a content marketer, that means topics, research and collaborators. Thanks to a system of upvoting, the best of everything rises to the top. These are topics that you can write about on your site. Top questions are likely the best topics. This is a head start on the research for that topic. Top answers are probably the most informative and complete. That’s what members of this network are called. They are possible contributors to the article you’re writing. Collaboration is key to content marketing! 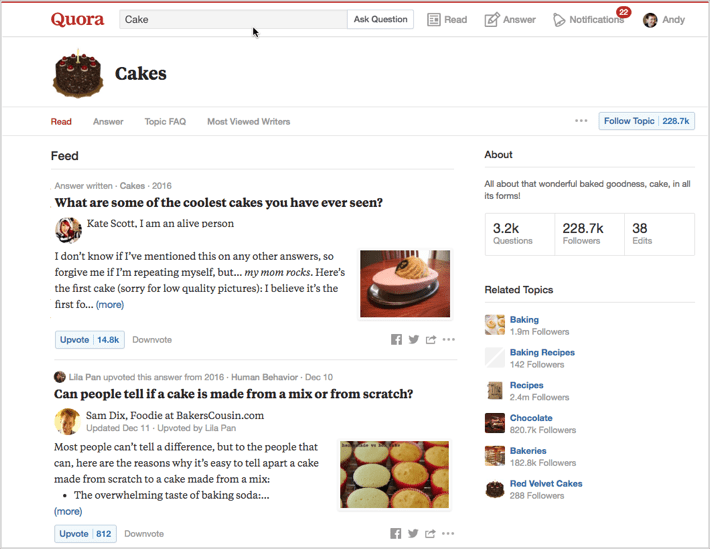 Quora also makes a great testing ground for new content ideas. Considering a topic that doesn’t appear here? Post it here and invite relevant Quorans to answer. This will give you a head start on research for your blog post. Want feedback on your content before you publish it on your blog? Post it as an answer and see if you get upvotes or comments. What’s working for them? The answers are easy to find. Competitive analysis tools are an excellent way to get ideas for what to write about. Since search engine rankings are public, there are tools that will show you all the rankings for any website. SEMrush is my favorite. Just enter the address of any competitor website and you’ll be looking at a list of phrases they rank for. This is a deep well of blog post ideas, each of which has an SEO advantage. 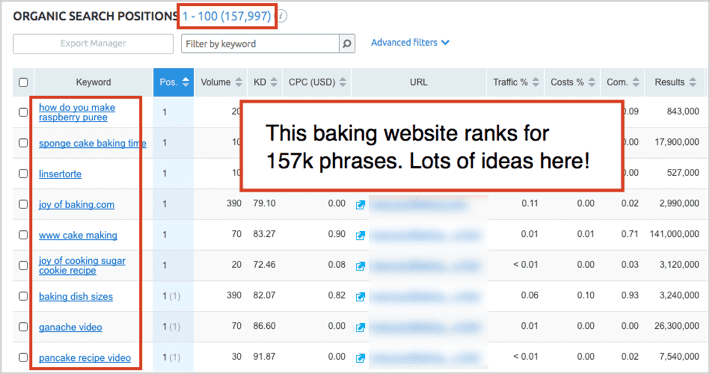 The free version of SEMrush shows you the top 10 phrases that any website ranks for. The paid version gives you all the rankings for all of their keyphrases. 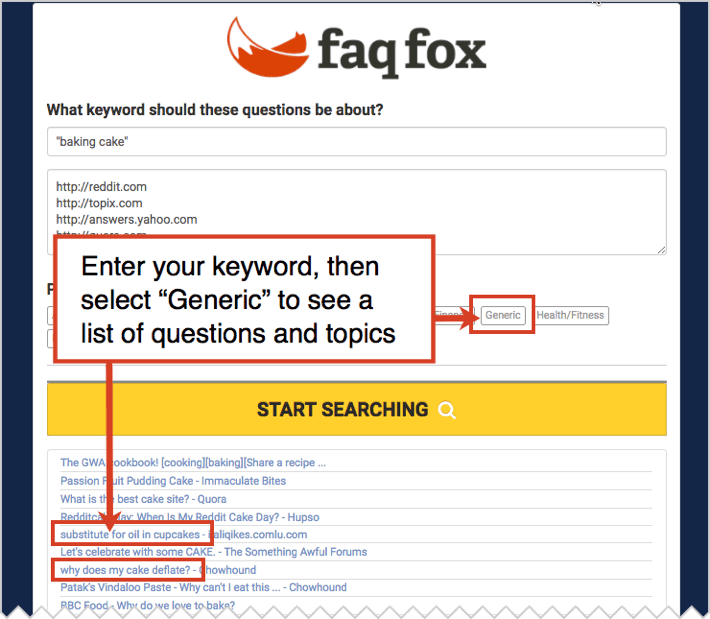 Here’s another tool that scrapes websites for popular questions: FAQ Fox. Just enter a topic or keyphrase and then pick a category (or pick “Generic” which often works a bit better) …and voila! A long list of popular topical questions. This tool searches niche sites and big guys like Reddit. You can also enter your own favorite sites, such as big industry blogs or competitors. Here we’ll use BuzzSumo in a slightly different way. 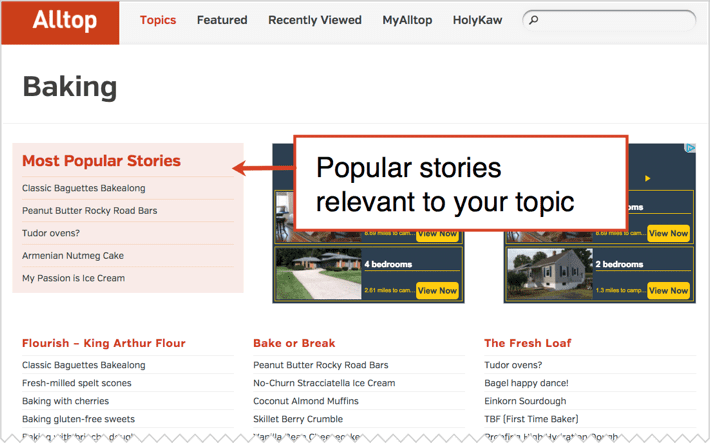 Instead of adding a topic, enter a website. It could be a famous site in your niche, or just someone who showed up on Facebook or in Google. You’ll see all the top-shared posts on their site. It’s a wealth of topics and the social networks where these topics found a happy home. It’s perfectly fine to use other sites for inspiration for topics. But never copy and always give attribution. There’s always room for another giant donut cake article on the web. If you get inspiration from others, mention and thank them in your new content. Maybe they’ll share it! The blogging pros that came before you can help. They’ve created tools for triggering a ton of writing topics. Here are a few of the best. I’ve been recommending this for years. It’s filled with 52 mini-templates for headlines and topics. The well will never run dry again. The team at Venngage suggests dozens of topics, each with a possible visual spin. Click refresh to see a new headline format, enter your own keywords and save them for future reference. Enter three words and seconds later you’re looking at a list of five blog post headlines. Topics for a week! Time spent reading is time spent collecting ideas. News aggregators are an efficient way to pull all of your newsletters and feeds together. They also offer excellent search tools for discovering new content and finding new topics. Both Feedly and Alltop are fast and efficient aggregators, great for both research and organization. Search for your topic and scan through the headlines with your next post in mind. Within minutes, you should spot a few themes and memes that you can repurpose on your blog. Alltop is great for finding trending stories. 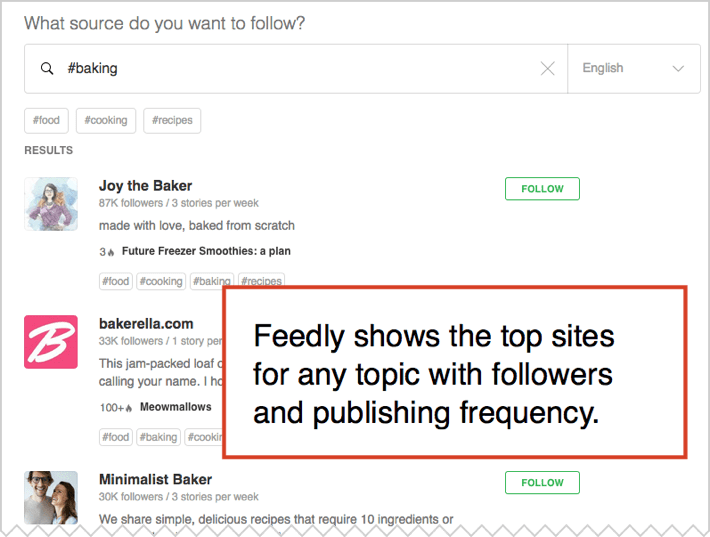 Feedly is great for finding (and then following) the top sources. Put the top sources into BuzzSumo to see what topics are doing well on the top sites! 11. Check the calendar for upcoming dates …Today is National ___ Day! This source of topics is a fun way to piggyback on things that are happening at the time. 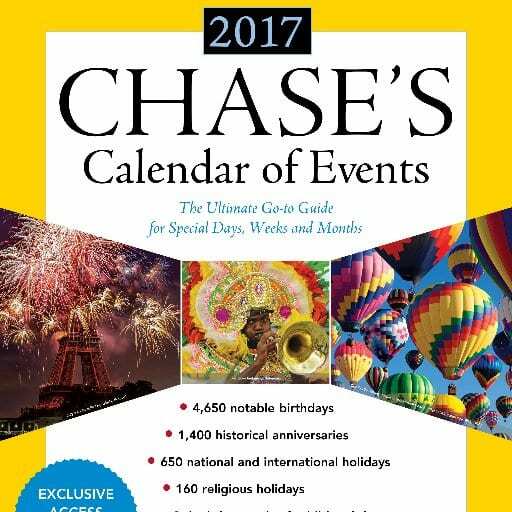 Get a copy of Chase’s Calendar of Events and scan through for dates and topics. This book has been in print since 1957 and includes events, holidays, anniversaries and birthdays for any date or month. It’s published every year and new copies are a bit expensive. But look around and you can get a used copy of last year’s edition for under $10. Or just search good for “National [topic] day” and plan your content accordingly. A timely theme will make your post perfect fuel for social media. In case you’re wondering, National Cake Day is November 26th. Most websites rank for hundreds or thousands of keyphrases. But most marketers don’t know what they rank for. When you know what you rankings, you know what blog topics are already working. Check your “Queries” report in Analytics. It shows all of your keyphrases and rankings. You can find it here: Acquisition > Search Console > Queries. Note: To access this report, you need to first connect Google Search Console to your Google Analytics. If you haven’t done this yet, there’s a short video with instructions here. Also, keep in mind that this report only shows data for the last three months. You can filter out all of the keyphrases (as in, queries) that include your brand name. This will help us quickly find blog post ideas. Click on “advanced” next to the filter box. Now you’re looking at a list of phrases for which you already rank. Here is the report within the Analytics of a baked goods website. This can be an amazing source of topics. 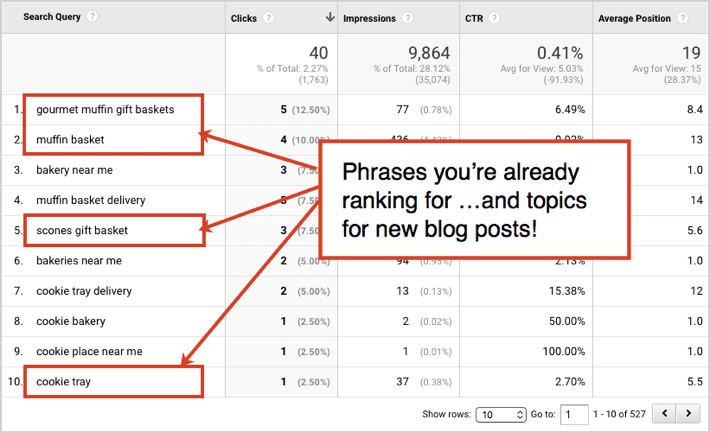 You may already be getting traffic from these phrases. If you write a new post on one of these topics, don’t forget to link to the page that’s already ranking through good internal linking. Does your site have a search tool? If so, your site has a listening tool. Everything that your visitors type into that little search box can be seen in Analytics. It’s in Behavior > Site Search > Search Terms and it shows what your visitors are searching for on your website. Note: Is the site terms report empty? If so, you’ll need to set it up. Here’s a video with site search setup instructions. This report often shows if there are problems with your website navigation, but it’s also a excellent place to find blog post ideas. Some of the search phrases may be functional, about actions the visitor wants to take (such as “jobs” or “donate”), but others will be topical and content related. Your audience is hungry for more content on these topics! Have you written a post for each of these yet? If not, you’ve just discovered an unmet content need of your current visitors. Time to publish on that topic. 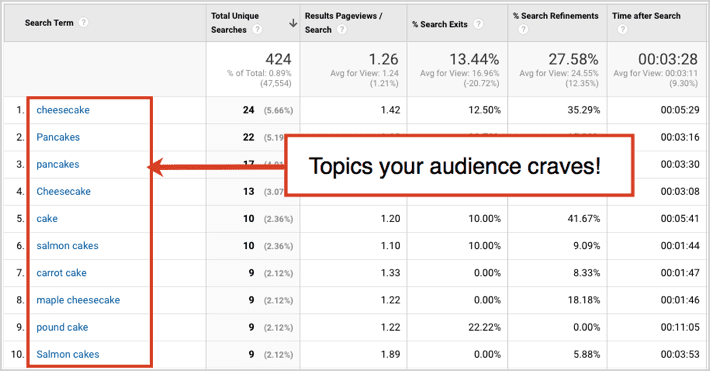 Google Analytics can quickly show you which topics your readers like best. Start here: Behavior > Site Content > All Pages. This report shows all of your most popular pages. To see just the blog posts, add a filter. This is easy if your blog is in a directory or subdomain. The data in this report is sorted by the number of Pageviews. But there are lots of reasons why a page might be getting a lot of views. Top viewed pages aren’t necessarily the most loved posts. To really see what our readers like, we should look closely at Average Time on Page. This number is more likely to indicate an interest in the topic. It’s not a perfect metric (it’s affected by content length, formatting and the use of video, etc), but it’s still a great indicator of readers’ interest. First, go to the All Pages report and set the view to “Comparison View.” Select “Average Time on Page.” This will compare the average time on the page to that of the overall site. After sorting the report, you can quickly see which posts outperform the others. Finally, scan through the list and look for patterns. Your visitors are telling you something. Are they more interested in some topics than others? Could you write more on these blog topics? If you’ve already written a well-received “how to” or “best practices” post, you can quickly repurpose the topic by taking a new perspective. Write the “mistakes to avoid” article. Write the evil twin. 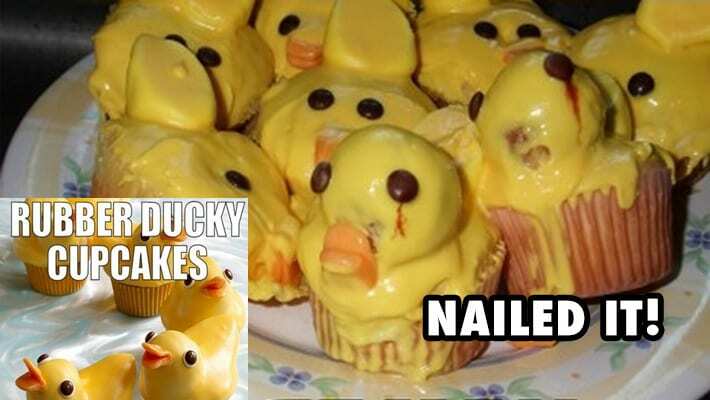 Evil Twin: That doesn’t look like the cookbook picture! Here’s a visual version of that evil twin with viral potential. Wait a while before posting the evil twin of any post, unless it’s a guest post for another website. Also, make sure to change and add to it. The idea isn’t to spin content. It’s to repurpose something that performed well. 16. Your email outbox is filled with blog posts. They emailed you a question. You wrote a considerate reply. Then you went back to work. This happens daily for millions of us. But only some this as a marketing opportunity. Every answer you send in every email reply is potential content. Each of these emails could be the beginning of an article. Email responses are great sources of blog topics. It’s relevant (your audience asked for it!) and it’s in a personal tone (which makes for great blog content). We all create content every day in email. The trick is to capture these topics and then polish and publish them later. For three years I saved every email that contained an answer or advice. At the end of that time, I had 92 pages of content. Some of these I immediately repurposed into high-ranking blog posts. Sound interesting? Efficient? Here are the instructions for turning your sent email into high rankings articles. Let’s round out the list with the all-time best source of topics: conversations with your audience. Every meeting and phone call with customers and prospects is a chance to uncover topics. If you’re inside a company that has separate teams for sales and customer service, go talk to them. Ask them what people are asking about. What are the top questions they’re being asked? What does every prospect need to know before they hire us? Then write a blog post about it. Or better yet, post these answers on your services pages to increase your conversion rates. People are unlikely to buy or become a lead if their questions go unanswered. Never waste a good conversation by having it in private. If you answer the question in a meeting, but never publish as a blog topic, the value of your answer is short-lived. But publish it and you can send it to people over and over again. Visitors can find it. It may rank in Google. People may share it. Conversations are temporary. Content is forever. We hope so. We really want this post to be a complete and comprehensive source of blog topic ideas, but there are just so many places to find inspiration. If need a few more, try Barry Feldman’s 33 Sources of Content Marketing Ideas. 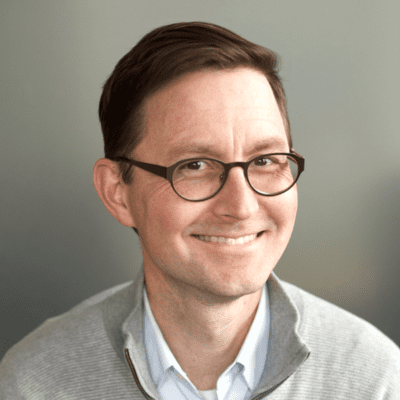 Andy, thanks for the wealth of great resources. What do you feel the current sweet spot is for a the length of a blog post? What a treasure-trove this post is! Thank you for sharing this info. Thanks, Heidi. No matter how many tools we use, that blinking cursor is still there staring back at us. And tools are no replacement for true inspiration, as you know! Good stuff as always Andy! Thanks for putting this together! I recently ran across a site called Answer the Public. It’s a gold mine of blog post ideas as well. Hope you are well my friend! I love that tool! I can’t believe I didn’t include it here. I’ll have to update this piece eventually. Nice to see you here, Russ. Hope things are going well for you guys. Let me know if/when you’re in Chicago! There are all kinds of good tools in here! I usually scramble around Google to find something to write about for my clients, but you’ve given me a full case of tasty morsels. I like that you always explain things in such a simple, concise manner. A whole lot of people should learn to write like this. Thanks for this wealth of information. Wow, I can’t wait to start digging into some of these Andy. Thanks as usual. One thought to add: For clients who are a bit more esoteric and don’t have as many articles or keywords out there (some specialized manufacturing companies, for example), we’ve found perusing presentation topics at trade shows gives us some good ideas. It shows what’s hot and can lead to some collaboration — you might also uncover some keywords you can rank for. These are awesome. I’ll be sure to try them. How about company focused topics? Like we released this new feature. Or we are trying this new approach to a problem. Basecamp has made a living of of this. This post is a gold mine – it’s going straight to my Evernote. No fluff. No bull. Straight to the point. I absolutely love what you said ‘listening is key’. My site has a search tool but I haven’t set up the query in Google Analytics. I will do so right now.